wife Nefreytaten (the mother of Senusret I). Amenemhat may have been the vizier of Montuhotep IV Nebtawyre who recorded two miracles while on an expedition to Wadi Hammamat. First of all a gazelle gave birth on stone chosen for the lid of the kings sarcophagus (and was promptly sacrificed by Amenemhat as thanks to the gods) and secondly a sudden heavy rainstorm disclosed the presence of a deep well. It is sometimes proposed that he usurped the throne, and even that he murdered his predecessor, however, there is no direct evidence to support this and he may even have been his co-regent. 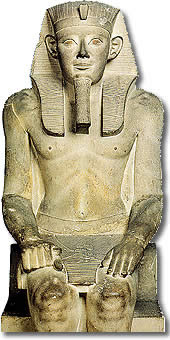 It is also suggested that he initiated the policy of co-regency with his son and heir, Senusret I, to avoid successional difficulties and allow his son a chance to prepare for kingship, but this too is disputed by some scholars. Thebes was still the centre of the cult of Amun and Amenemhat added to his temple at Luxor, but Amenemhat moved his capital to an area south of Memphis which he named Itj-tawy ("siezer of the two lands") thus divorcing the base of power from both Thebes and Herakleopolis and only a few officials were buried on the west bank near Thebes during his reign. He also promoted Ptah, whose cult centre was Memphis, and there is evidence of his building works at Kantir, Bubastis, Heliopolis, Memphis, Wadi Natrun, Abydos, Dendera, Koptos and Tod. He made efforts to restrain the power of local nomarchs by replacing some of them with his own men, but he left those loyal to him in place and many remained so powerful they even began expressing the date in terms of their own rule, not the king's. He took steps to secure the provision of the resources which were key to Egyptian prosperity and power. His name appears near the diorite and carnelian quarry in the western desert near Toshka and he reinitiated trading and diplomatic links with Byblos and other Aegean civilisations. He mounted expeditions against the Asiatics and Nubians to quell rebellion. He also constructed forts at Semna and Quban and rebuilt the fort at Buhen to control Nubia and a string of fortifications known as "the Walls of the Ruler" (which are referred to in the "Prophesy of Neferti" and the "Story of Sinuhe" but have not yet been located) in the eastern delta to control the Sinai. There was at least one expedition against the Libyans led by his son Senusret, during which Amenemhat was assassinated. He is referenced in as number of important Middle Kingdom texts. "The Prophesy of Neferti" compares his peaceful rule with the chaos that reigned before seized the throne, however, the text is now seen as propaganda composed on his instructions and there is no direct evidence that the period before his accession was chaotic. His assassination is mentioned in "The Story of Sinuhe" and fully described in "The Instruction of Amenemhat I for his son Senusret". The latter text was originally considered to have been composed by Amenemhat after a failed assassination, but it is now generally held that the assassination succeeded and the text is a fictional account intended to represent the king's ghost talking to his son. It is even proposed that it may have been the inaugural address of his successor Senusret I, but that cannot be verified. Amenemhat built his pyramid at Lisht, close to his capital. It was smaller than those of the Old Kingdom, and composed of a core of mudbrick and limestone blocks "recycled" from Old Kingdom monuments at Giza and Abusir (although this may also have been to enhance his position by associating his monument with these illustrious rulers as the art and architecture of his pyramid complex owe more to the traditional Old Kingdom style than the newer local forms which had developed during the First Intermediate Period). It was then clad in fine Tura limestone, all of which was removed in antiquity. The substructure of his pyramid has not been excavated due to the seepage of water but it is thought that it was accessed by tomb robbers. Like the Old Kingdom rulers his mortuary temple included traditional scenes of the festivals of renewal and his pyramid was surrounded by the mastabas of his officials.